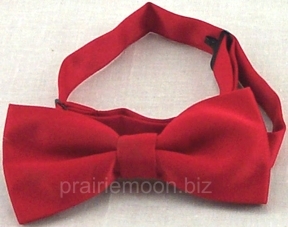 Make your soda jerk outfit really snazzy with our red banded soda jerk bow tie. Youll need to provide the white shirt and black slacks. Add a classic soda fountain cap and either the soda jerk waist apron or bib apron and your 1950s old fashioned soda fountain outfit is complete. The bowtie is the easy pre-tied style. Theres no actual bow to tie. The adjustable neck band fits around your shirt collar and is the same satin polyester material as the bowtie. Now youll look the part when making an egg cream or shake one in the hay (soda jerk lingo). Tie was very silky, looked great and was easy to wear. We used the bow ties and soda jerk caps in our retro ice cream shoppe. Everyone loved the look and said we brought back memories on the 50's. These were perfect for some characters in an opera that took place in a soda shop. They looked so good! You would never know the bow tie only cost $5. High quality! My 88 year old birthday boy wore this to his party. So cute and better than a boutonnière. Great quality, especially for the price! This is perfect! Right color and right look. Surprisingly impressed with the quality of these bow ties. It is difficult to buy items online and feel comfortable that you will actually receive anything close to the picture. Not the case with Prairie Moon! The bow ties were higher quality than I thought, they adjust easily and look great on. No one will believe that we paid $5 a piece for them. These were perfect! My husband and friend dressed up as soda jerks for my son's wedding reception. We had a ice cream/dessert bar and it was a huge success!